Please email us at Air Where Email to send any pics or news etc. 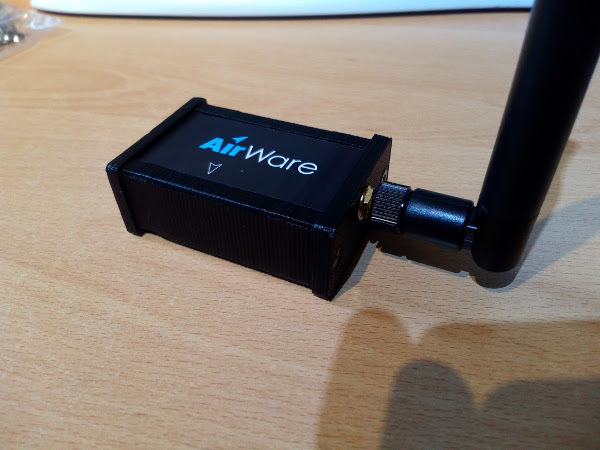 AirWhere discussion is now on a facebook group, please visit this page to ask any questions. v12 and v13 are NOT compatible, this is a major update. This will be on the development version for a few days so if people can test, see if their unit seems ok and then will put to live, I will create a video for people who havent updated their unit before in the next few days. Once you have updated to the v13 you can drop back again to v12 for flying if you want to be seen by the current ground stations. If theres no issues in the next few days I will update the ground stations and then go live with v13. Back end live tracking has been upgraded to it can handle many many users - tried 60 windows , it was fine. Will update site with details of voltage regulator details to be added, this helps a lot with reception - please contact me if you need your unit retro fitted. 8/3/2017 Two successful evenings done for the Derbyshire soaring club and the Cumbria soaring club - ground stations are planned, more units being built - more ideas coming ! v13 will be out anyday now with Skytraxx compatibility - watch this space. 9/2/2017 Version 12 released - none critical update. add wifi reconnect if its on hard wired. add registration number config - please register on the site and pick a number and fill this field in, the current number will still work but this will be phased out. 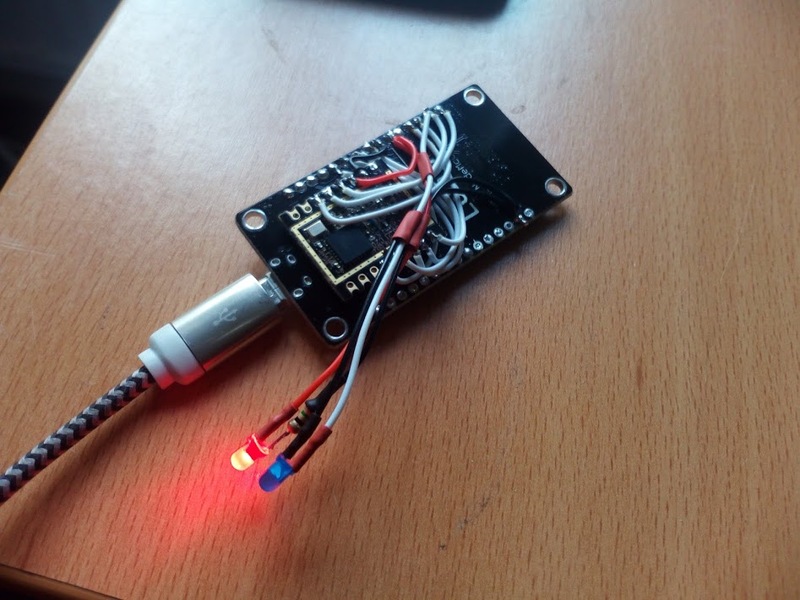 More instructions about these will come shortly - sounds are now working but really complicated and I might just wait for the port to the esp32 now its out, then we can have baro aswell very easily. Working on v13 - major update coming - new instruments to be supported coming shortly. 23/01/2016 More info going on up the facebook group page - please join to get more information and add your own pics, new ground stations going up all over the UK, lots of new units being made - we are doing a talk at the Derbyshire/Thames Valley and Newcastle club in Feb/April so please be sure to come along and see the system yourself. 9/12/2016 Added some help pages for the build, simple procedures to make sure your hardware is working. 8/12/2016 AirWhere evening ran - 8 pilots on their way to building the unit. 20/11/2016 A good day, new ground station aerial up a roof with preamp and filter, tested to the ground 3km away no issues, pilot spotted 13k away, reliable signal with antenna down. Full system is now tested in a real world situation, great results. More ground stations coming soon ! 15/11/2016 So... bit of a change of name, dont want any hassle from a similar named company as we are basically a free organisation creating something to help each other out ! Will run both websites concurrently but will be called AirWhere from now on, if anyone knows of any other company called this then let us know, hopefully this will be ok.
14/11/2016 As we predicited no flying on Pendle for more ground station testing, however a great day yesterday, 4 hard wired units working perfectly on Parlick, Kobo Glo and mini case now finished, Kobo Mini AirWhere. 4/11/2016 Busy Day ! Ground station up on Pendle, no doubt there will be no flyable weather there for the next ever for testing ... ! Thanks to Dave G for this, good man! Testing is under way. Version 9 out, RSSI indicator ( Signal strength ) added to the webpage so you can test new aerials or antennas to get the most out of the system, please update. 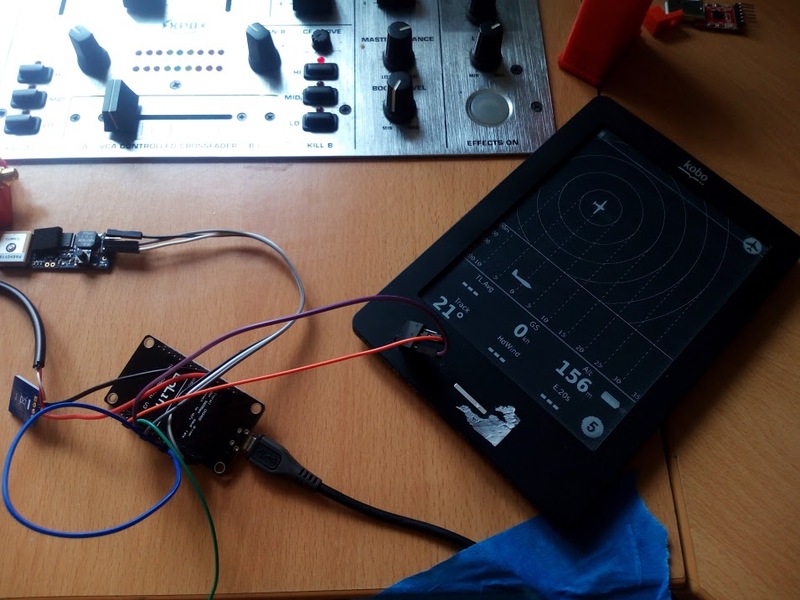 2/11/2016 Work has started on adding barometric support to the project for an extra £1 ( for a simple sensor ) or an extra £4 for the ultra high resolution one. We will also be adding a speaker for sounds for around 50p and then in time a vario built in making this a complete instrument. Unfortunately we are nearly out of GPIO pins on the current ESP8266 but with the ESP32 out now we will have many more to play with. Just waiting on the ESP32 to come out as a development board at the correct price. 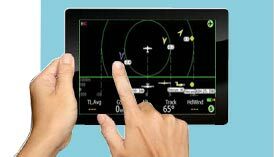 1/11/2016 As a special offer, we will build up 2 complete kobos for just the price of the parts for 2 pilots in every club in the UK to get people started, please contact us for details. In return these lucky pilots will have the job of demonstrating them to their club. 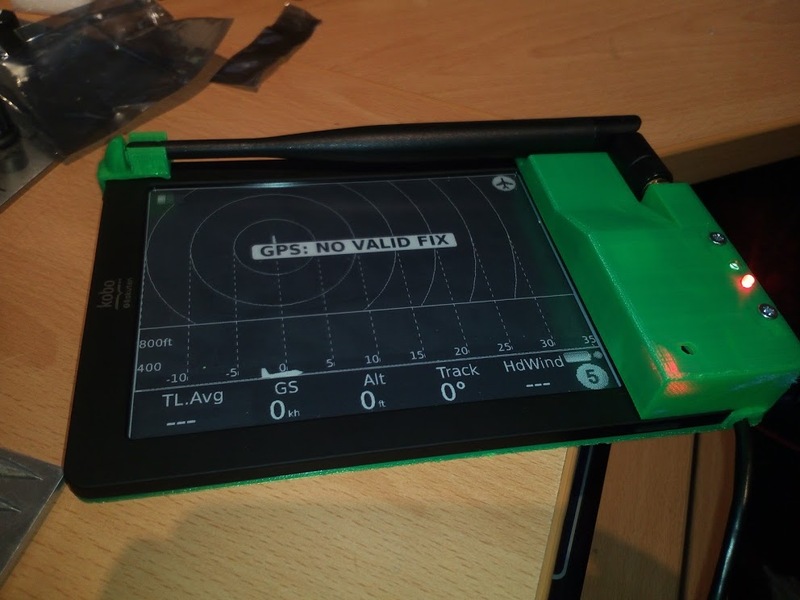 We will require to be sent a Kobo touch, glo or mini and then we will return the instrument with 1-2 weeks with full airware system / larger battery / GPS and maybe vario on board for the cost of the parts we have added. 31/10/2016 Webpage updated with the new build instrucitions for a Wifi version, standalone hard wired version and the one we like the most, the complete system in one. Did some more test on half wave and quarter wave antennas, the half wave is just slightly better than the quarter, both giving excellent results at 2-3km away. System running perfectly again, feel free to dive in and make one. We are available to a a talk at any club night and to run a "build an Air-wave" evening if anyone would like to have us. 8/10/2016 After a successful talk ( I hope ! ) at the Dales paragliding club, some more interest in the unit. 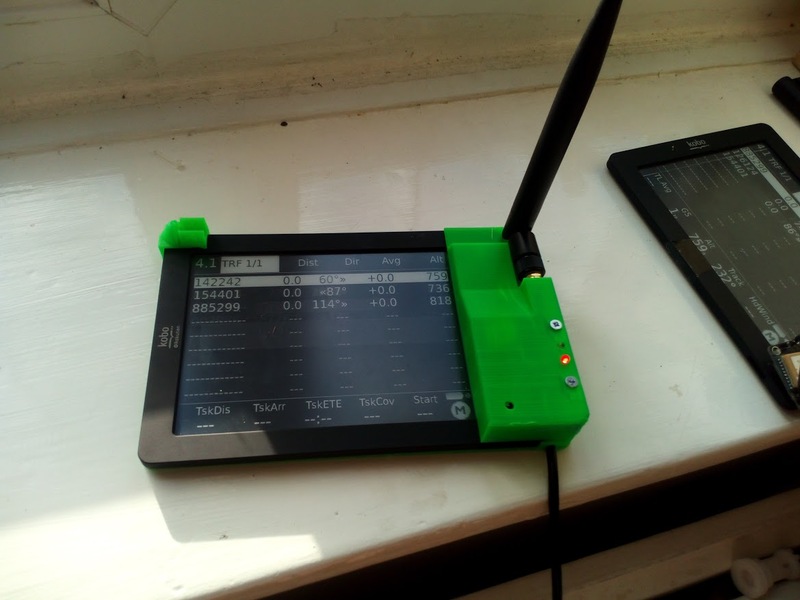 Tried a larger backplate on with a 4500mah battery with the kobo and airware, getting 30+ hours out of the unit, thats just for £7 more... so thats the way to go I think ! The new unit is mainly done, few small bug fixes to sort but majority is completed, makes for a very compact unit see here. Circuit diagram and a build video to follow shortly. 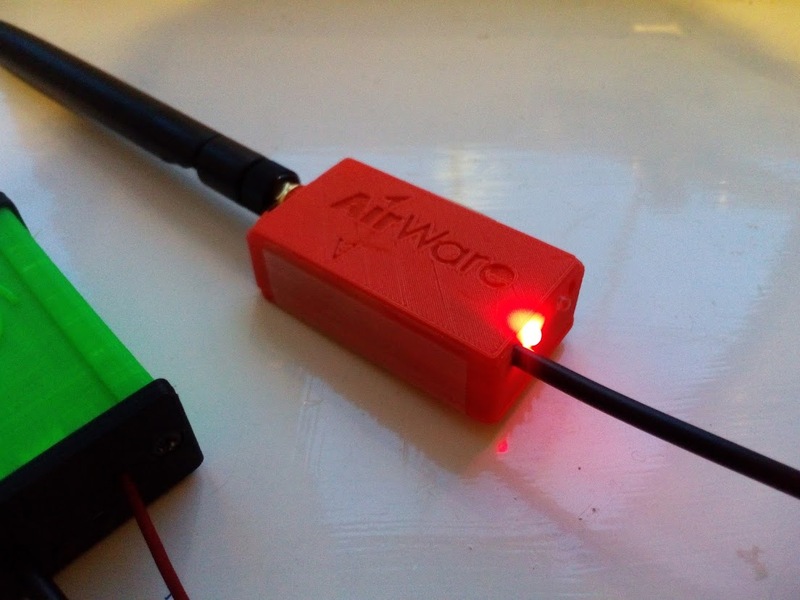 4/10/2016 First units of the wifi and hard wired version have been made, testing is revealing some amazing results, the LORA transmitter seems much more powerful, even with a small piece of wire for an aerial its getting better results than the ARF, will be fitting proper aerials soon and testing, very impressed so far ! 27/09/2016 We now have a new Transceiver sorted, this is now much cheaper aswell, £9.68 delivered ! This brings the cost of the unit down to around £20 to make, which we think is amazing. Just in the process of testing and adding into the original system. We have also started working with a major instument manufacturer! We will continue and produce the free version which will work with any instrument with wifi and they are going to produce a retail version. Dont worry we will always be free ! Apologies regarding the ARF, it was out of our control, the company has ripped us off aswell, not good for what we are trying to do, but thats life, we are heading in a much better way now with support and a brand new chip, details coming soon once we get it all working. Thanks for your patience. 01/09/2016 Please hang fire making one of these units, the company selling the ARF have decided to close down and they wont for some reason make the ARF available anymore, or release any of the code so we can continue. 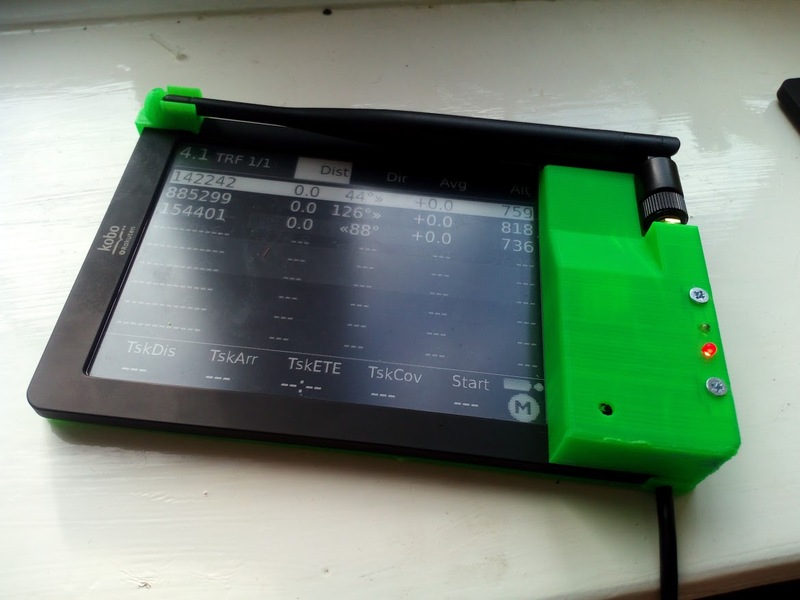 26/8/2016 Lots of wresting with a problematic 3d printer for a few days, finally managed to make a prototype case which seems to work well, pic here , here and here. 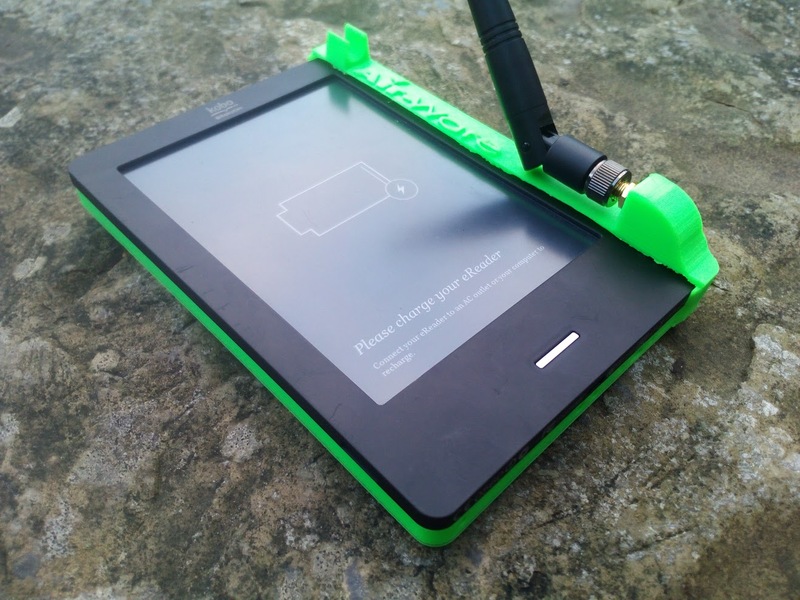 This system pulls 200-300 mah with charging the kobo and the vario, really good power consumption. 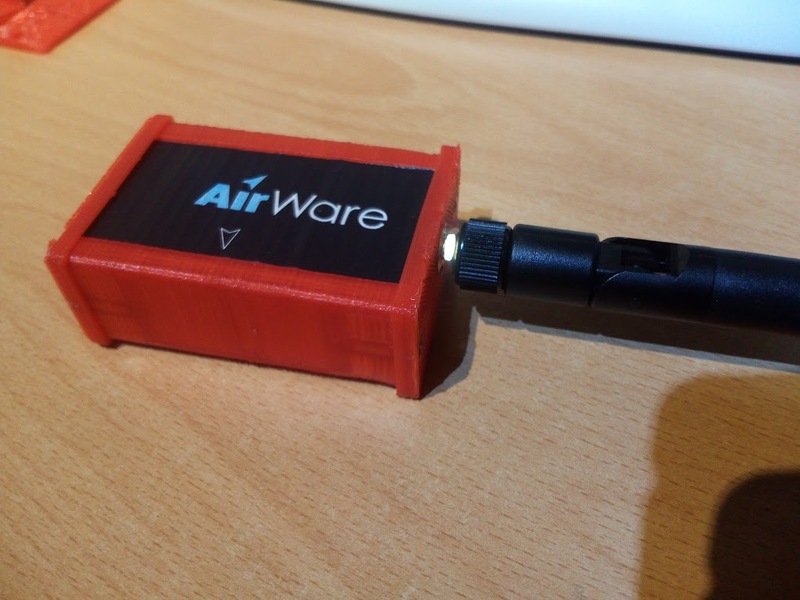 A new version of Airware will be out soon with the ability to switch between this hard wired version and the wifi version, just needs some more testing. Hard wired schematic will be added to the website shortly, however if you would like a go at making one let me know and I can send you the rough details, its basically the same with a few more wires added. 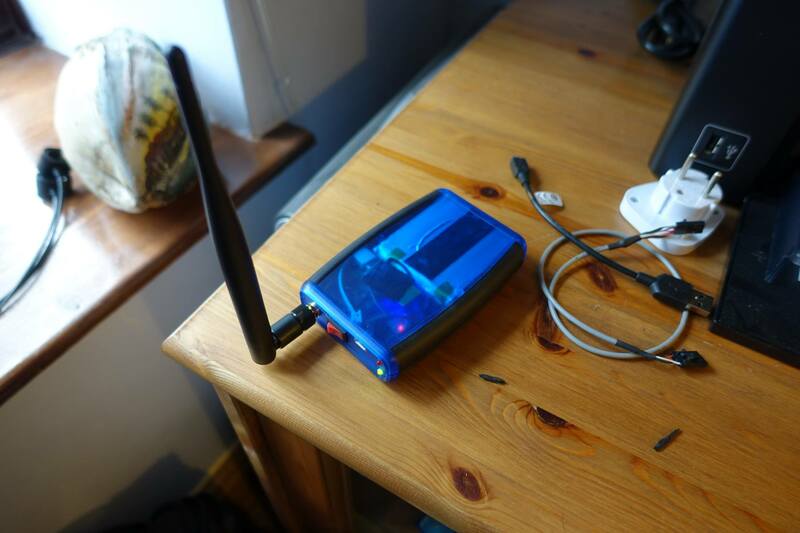 This case also has an antenna mount for locking the aerial away for take off and to keep it safe, few changes needed to the print file and that will be released aswell. 29/06/2016 And in blue, sorted 3d printer out now so producing a much better finish, also created the smallest box possible to fit just the ESP and the ARF inside for smaller flight decks to mount vertically, see images page for details. 22/06/2016 Ground Stations added to the tracking page, as soon as you setup a station it will appear on the tracking map, when we start getting data from these stations we will start plotting the range. A new box is underway, side mounted one, pics coming soon. Just purchased 10 ARF's with a 5% discount, so if anyone wants one a little bit cheaper, without the £5 postage charge then let me know. 15/06/2016 v5 out now, added an nrf905 selector, please update and you can specify if you are running an nrf905 or not, default is not. 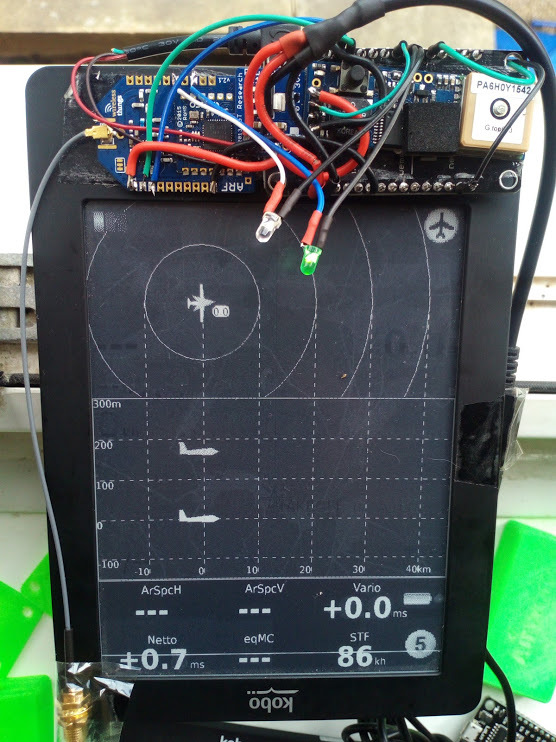 If the nrf isnt attached the live version used to report error packets coming in on the nrf905 channel, system still worked fine but lots of bad packets reported, fixed now. 14/6/2016 Once you have enabled livetrack 24, you can then link into the Telegram retreive system at www.xcr.org.uk.... lots more tracking options ! - Contact us to map your live track user to the Airware ID, this is done manual at the moment, but when / if ;) Airware gets going then this will be added as a LT24 feature. 13/6/2016 Also available in black and well, basically any colour ! 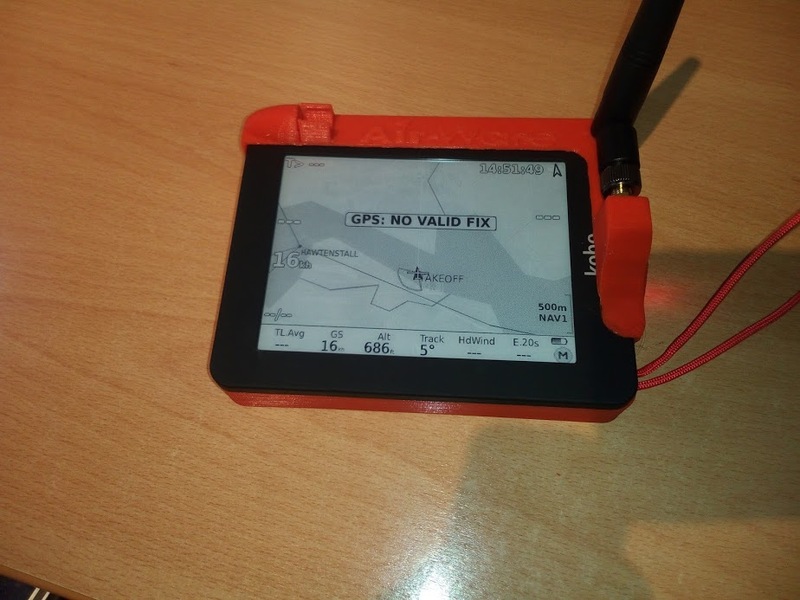 Please update to v4, a small typo broke the configure setup, adding all the ground station code, Thanks - also looking for someone to run a facebook page regarding Airware, let us know if you fancy it ? 9/6/2016 Thanks for the wonderful people at Livetrack24 we now have Livetrack support, if your running data on your phone or someone else!! is running data or a ground stations spots you, your live track will be shown, hopefully with the addition of ground stations in busy places, using your data will be a thing of the past, no more data fees, loss of signal problems etc etc. Details on how to link your Airware unit into your LiveTrack ID will be coming shortly. 26/5/2016 3d printed box is on its way hopefully, found a very helpful club member to help make one! hopefully we will have something soon to be able to purchase and/or available in kit form. 25/5/2016 Version One released, couple of small bugs still to sort, seems 100% stable now, one unit up for 9 days with no problems :) Tracking and registration pages nearly done.